I do not wear a watch and haven't for a very long time. I prefer to navigate life without the oppressive rule of time. Aren't you in the medical profession? YER <zederated> CAST, <zederated> FACE! NOW. GET OUT. YOU DISGUST ME. Yes, but watches aren't a necessity in the hospital these days. Machines check heart rates and respiratory rates. Besides, every room has a clock on the wall. We also stopped wearing white skirts, white stockings, and white caps too if you hadn't noticed. Timex Ironman Triathlon - all day, every day. And before you ask, no, I don't run triathlons, or Ironman events, or marathons, or...well...pretty much anywhere. I use a activity tracker that is also a watch. I have an activity tracker that is also a wife. One's wife is also one's social secretary, Colonel. We have one hold-out at a local ER that still wears starched whites. She has several nicknames and most of them contain the word 'iron'. She's been a nurse since before dirt and has utter contempt for anything contemporary. I'm certain she wears a watch. Bet it's one of those upside down brooch watches. Don't know about being one of the "them millenials," but I haven't worn a wristwatch since the 80s. I used to scratch the faces, so I went to carrying a wristwatch in my pocket until I got a cellphone. I have a Fossil around here somewhere still in the box (received as a gift), but I don't even remember where I stashed it. Yes, I'm a man you see. . . 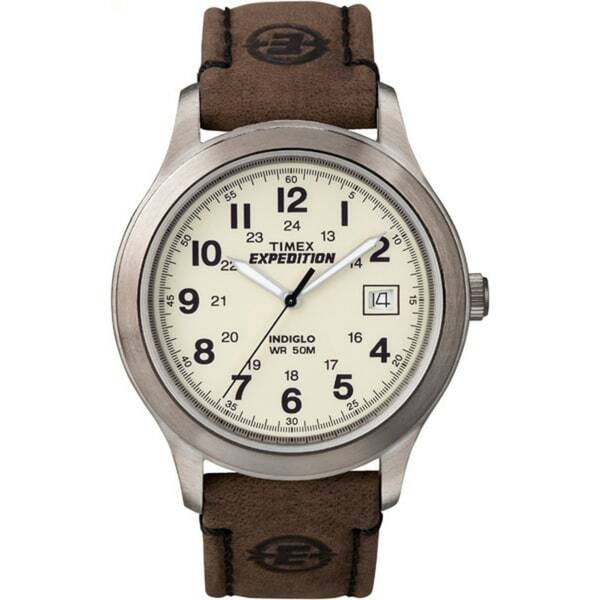 Yes, Timex Expedition. But I replace the bands with nylon or hemp bands with a velcro closure. I have . . . a Timex expedition . . . I never leave the house without my wallet, wrist watch, handkerchief and a pocketknife. Absent any of these things I would likely feel strange. My wedding ring never comes off. My cell phone is often left behind. 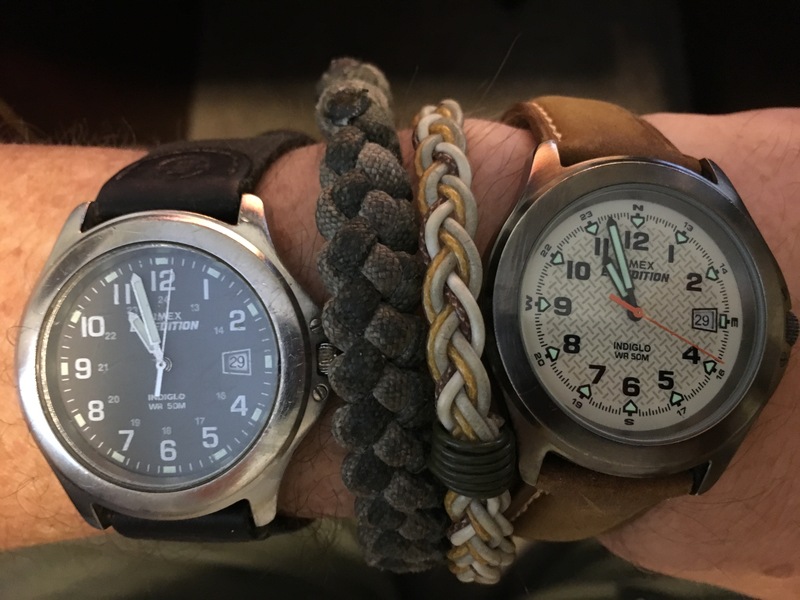 I wear the Timex Expedition daily . . . I see a trend here. I have the two wrist watches shown below, both Timex Expeditions. These are the only two watches I own. The one on the left is perhaps 18 years old. It's the one I wear if I know I'll do any dirty work that day (which is not very often any more) The crystal is scratched and the housing is pitted to hell but it keeps on tickin'. It would still be my every day watch but one of my kids bought the one on the right for me a couple years ago (I picked the exact model and sent her a link). I just put the new leather band on it last week. I replace the bands every 2-3 years when they're so rotten they're about to break. It's funny, but I carry the exact same gear as DP. My hanky is usually a large bandana printed affair, except when I go to a funeral - then I carry two pressed, white hankies. One for me and one to offer any lady I see who needs one. BTW - At a soccer game last Saturday, Grandson #1 (he's 7 or 8 ) was very proud that he could finally read the time on my watch. The only other analog time keeper in his life is the clock on his classroom wall. I took the watch off and let him wear it for a while. That was a big day for both of us. Like DP and FredS I carry all those items. But I have several of each and rotate them as the mood strikes, one pocket knife one day and a different one the next, same with the watches...today in honor of this thread, I pulled out the Bulova Aerojet it is an Automatic from the late 50s. Looks like this one but with a gold case. I started wearing a watch and carrying a pocket knife when I was 7 or 8 and it is very very rare that I am found without both in one form or another. I have not worn a watch for years. I didn't carry a phone either until I was required to do so for my current job. Pretty sure it was a knock-off, as it was inexpensive and has since stopped working, but it was a great watch when I needed one. As soon as I didn't need one I stopped wearing it. So there are only a few of us dumb enough to own mechanical watches. I would have figured durangopipe for one, probably the mechanical Timex he had as a child, lovingly maintained. But he's smart enough not to do that. Mine was my father-in-law's AND a gift from my wife the day we became engaged, so it has enormous sentimental value, but it's also the gift that has pretty massive maintenance bills every few years. By contrast, the watch they gave her for graduation costs us twenty or thirty dollars for a new battery every couple of years and keeps more accurate time. I own a mechanical pocket watch (Colibri) which I carried for a few years at JFH. I don't think they make it anymore. I used to listen to the ticking to help me sleep; I should dig it out and try that now.